In this lineup, they’re all guilty of terror: Karen Baum, James FitzGerald, Justin Lonesome, and Jonathan Visser comprise the “Two Tales” cast. The show is newsworthy on several counts. Presented as a lead-in to PICT’s upcoming season, it serves notice that the company’s own house is not about to fall. You can read more about PICT at the end of this review. Meanwhile, Two Tales offers a rare chance to see Poe performed live. Poe was a spellbinding writer. His stories have been adapted countless times for films and TV, in versions from animated shorts to full-length features, but in this age of modern media they aren’t so often made into live theater. The PICT double-header is thus of special interest to Poe fans, or to anyone curious about his work. In “The Tell-Tale Heart” you get a faithful rendering of the original. Poe wrote this short, bizarre story in the voice of a deranged man explaining how and why he committed a murder. PICT has staged it as a one-man piece, with actor Justin Lonesome playing the part dramatically, in words and gestures taken straight from the page. “The Fall of the House of Usher” is a longer, more intricate tale. Here, Poe mixed multiple storytelling devices to spin a spider-webby portrait of an eccentric aristocrat and his mad sister, trapped in a “house” of their fears and obsessions. The story is so fraught with symbolism that it has kept literary scholars busy for more than a century … and so deeply creepy that it has inspired generations of horror-movie knockoffs. One may wonder: Why even worry about how closely the Two Tales follow the spirit or letter of Poe? Shouldn’t any adapted story be judged on its own merits, as if new? My answer is: Yes, usually, but Poe wasn’t just anybody. 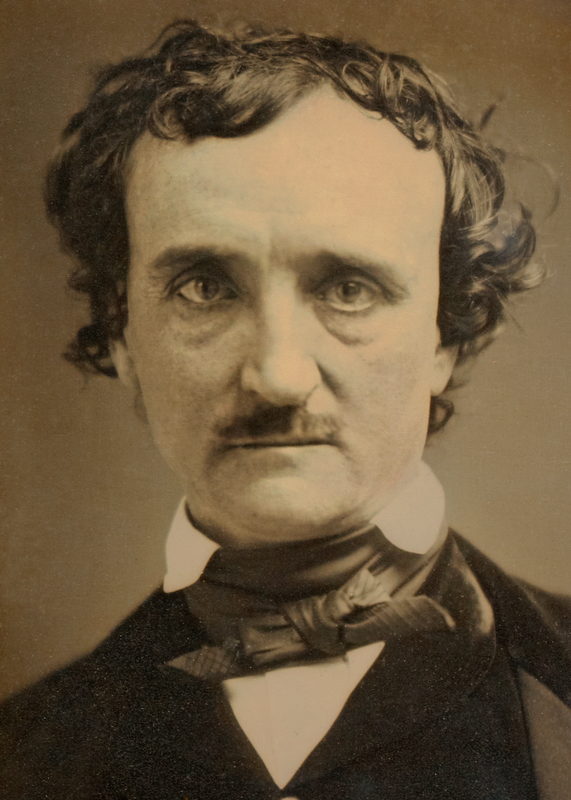 Edgar Allan Poe (1809-1849) lived fast, died young, and left a vastly influential corpus of writing. He’s often mistakenly seen as a sort of grotesque genius—a derelict who wrote dark, tortured poems and stories reflecting the travails of his wretched life. That picture is only half-true at best. Believe it: Poe was sharper than he’s cracked up to be. Like many people in the days before modern medicine and social safety nets, Poe suffered the untimely losses of persons dear to him and oft struggled with debt or misfortune. Like many writers past and present, he had a drinking problem. Yet despite it all, Poe did not wallow in woe. He was capable, witty, and energetic. He edited literary journals and magazines. He served, briefly, as a sergeant major in the U.S. Army. Poe could be unconventional—he really did marry a cousin half his age (he was 26, she 13)—but as a writer, he was both prolific and astonishingly creative. Poe invented detective fiction before the word “detective” was coined, creating the amateur sleuth Auguste Dupin for stories such as “The Murders in the Rue Morgue.” In a very strange long essay called “Eureka,” he expounded a theory of the universe that contradicted and even joked about nearly everything known to science at the time—but that also presaged some key concepts of today’s physics, including the Big Bang Theory. Poe’s creepy tales, like the two PICT has adapted, are considered to be high art rather than schlock because they don’t rely on made-up monsters or scary plot twists. They are tales of psychological terror. The characters have quirks, fixations, and irrational passions similar to those we all have. What Poe did was to dramatize the fundamental oddities of human nature in a singularly striking manner. He took them ‘way over the top, in stories that feature outlandish settings and extreme consequences, but do not ring false notes in terms of depicting how people really are. That’s the quality that one would like to see honored and preserved in adapting Poe. And on that score, Two Tales of Terror ranks as a serious adaptation. I saw the show on a preview night, before the official opening. Some friends were in the audience as well. Not surprisingly, our opinions varied. One person flat-out didn’t enjoy the evening while the rest of the gang, including me, had a more positive theatrical experience. A friend who’s himself a skilled actor and director gave Two Tales a hearty two thumbs up (but of course pointed out various details that he would’ve done differently). In my view, the simple one-man treatment of “The Tell-Tale Heart” hits the mark straightforwardly and well. Without revealing spoilers, the nub of the story is: Here’s a guy who has done something insanely wrong, yet in confessing the deed, he’s trying to persuade you that he is rational and clever. It’s a tight little mini-case study in delusion and I think the case is made. As for “Fall of the House of Usher”: This story begins when an unnamed and actually rational man (played by James FitzGerald) visits his old school chum Roderick Usher (Jonathan Visser), who has gone alarmingly round the bend. Usher, the elegantly cultured scion of a noble old family, seems beset by a weird assortment of inhibitions and nameless dreads. He’s been holed up in the crumbling family estate that he shares with his too-weird-for-words sister, Madeline (Karen Baum), who floats mutely in and out of the scene. “Usher” is meant to be more than a sketch about upper-class twits turned reclusive. It’s supposed to mean—well, depending on whose interpretations you listen to, it’s supposed to mean lots of things. The interactions between the loony Ushers and their hopeful-but-helpless guest get progressively weirder, until they lead to an inevitable bad end … and altogether, the story is a damned tricky one to pull off, anywhere other than on the pages where Poe set it down. The PICT team makes a rousing go of it, hitting high points along the way. Visser is enthralling as the bizarre Roderick Usher. He struts and frets in a fashion I can only describe as gleefully ghastly. (Though I would note that Poe’s Roderick is written to be more nervous and twitchy.) Some new lines that Stanford has added to the script are zingers; the stage effects are suitably haunting. The whole thing seems decidedly more Poe-ish than some other well-known “Usher” adaptations, like Roger Corman’s 1960 House of Usher film, which went for a different brand of terror by altering the story substantially and casting Vincent Price as a sterner, fiercer Roderick. Does PICT’s Two Tales of Terror add up to a merry evening in the month of May? No, but neither is that the intent. On a dark and stormy night of the soul, you may wish to check it out. Poe’s Two Tales of Terror, adapted and directed for PICT by Alan Stanford, has been assistant-directed by physical movement virtuoso Mark Conway Thompson. His touch is evident in the artful movements displayed by actors of both tales. Through May 20 in the Henry Heymann Theatre in the Stephen Foster Memorial, 4301 Forbes Ave., Oakland. For showtimes and tickets visit PICT’s website or call 412-561-6000. PICT Classic Theatre, founded in 1996 as Pittsburgh Irish and Classical Theatre, was beset during the past year by a perfect storm of unfortunate trends and events. The company regrouped, in part, by substituting an affordable two-character play (Willy Russell’s Educating Rita) for a large and complex play (Shaw’s Saint Joan) and dropping Shakespeare’s The Tempest entirely. This allowed PICT to wrap up the 2015 season with a fine, full-scale adaptation of Dickens’ Oliver Twist. A number of major changes have now been arranged. Chiefly, PICT will re-start in September at a new and smaller home, the Union Project in East Liberty. (Hidden benefit: Smaller venues make for intimate theater. I recommend them.) The Foster Memorial’s downstairs theater, where Two Tales is being staged, seats about 150 and is quite close to the size of the Union Project space, so it provides a taste of how the new home will feel. 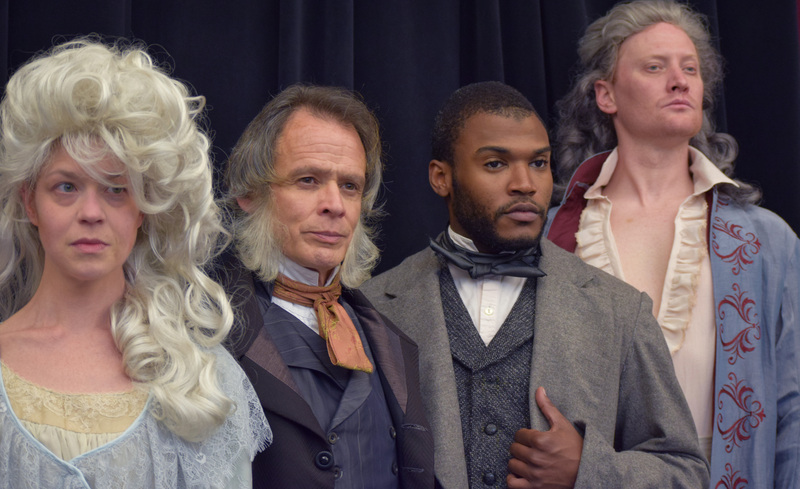 What won’t change is PICT’s focus on “classic” theater, which generally means doing plays written or set in times previous to the Internet era. That covers a lot of territory. The upcoming 2016-17 schedule includes Shakespeare’s Merchant of Venice and Sophocles’ Oedipus Rex, along with some 20th-century favorites. Classic enough for ya? Thought so. Stay tuned. Photo credits: Cast of Two Tales, courtesy of PICT Classic Theatre. Edgar Allan Poe, identity of photographer uncertain, 1849.